Use Emirates miles for VIP Arsenal tickets – a good value Amex MR redemption! Just when you think you know most of the tricks in this game, something comes along to prove you wrong! I owe this one to Tom at euflyer.com who also comments at Head for Points on a regular basis. Emirates Skywards miles used to be totally useless in small quantities unless you happened to be in Dubai and could redeem for retail vouchers. The situation improved a couple of years ago when they launched a tie-up with easyJet, allowing you to redeem Skywards miles for credit towards a flight. The value per point was pretty low at 0.4p. Something more interesting – and more valuable – is now available. 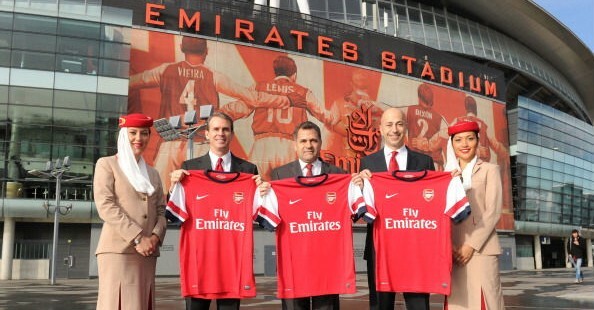 Emirates sponsors a number of football clubs across Europe. For a selection of games it is making tickets available to Skywards members at a decent rates. Full details can be found on the Emirates website (log-in required). For HFP readers, the most useful is Arsenal. You can also redeem for tickets for AC Milan, Hamburger SV, Paris St Germain, Real Madrid and SL Benfica. As of 8pm last night, tickets are available for Arsenal vs Everton, Arsenal vs Chelsea and Arsenal vs Liverpool. The key here is the pricing. For weaker opposition, basic tickets are 10,000 Skywards miles each. Given that Arsenal games tend to sell out, this is not a bad use of miles. For the three games above – which are the only three left available – tickets are 15,000 or 20,000 miles each. Far better, though, is – for weaker opposition – 15,000 Skywards miles for a seat in the Emirates box. This comes complete with full hospitality including food and drink. I don’t know what Arsenal usually charge but when I bought my father-in-law something similar at Chelsea it was £250 per head – and that wasn’t even for a box seat. Unfortunately, the two games remaining are pricier than that. Everton is 30,000 miles per VIP seat. Liverpool is 40,000 miles per VIP seat. Chelsea is no longer available because me and my father-in-law are going! Take a look here if you want more information on the tickets that are available. The Arsenal games appear to be capped at two standard and two VIP tickets per match. If you are willing to travel, there are tickets still left for games in Europe this season at AC Milan, Hamburger SV, Paris St Germain and SL Benfica. The Real Madrid games are sold out. VIP hospitality is available for most. Emirates Skywards is a 1:1 transfer partner with American Express Membership Rewards. Amex Gold (review here) comes with 20,000 points for signing-up or 22,000 if I refer you. Amex Platinum (review here) comes with 30,000 points for signing up or 35,000 if I refer you. This means that the sign-up bonus would get you all the Skywards miles you need (30,000) for two tickets in the Emirates box against weaker opposition! You should also keep any eye on the Emirates credit cards. The Elite can carry a bonus of up to 25,000 miles when it is on promotion. I don’t think the standard arsenal tickets are amaxing value as you can get them with anot arsenal membership but the super box tickets are very good. For the cheaper games it can’t be terrible value though. Top tickets are £59 at a guess? That is 0.6p per mile. I doubt you could Chelsea for love or money as a base level registered club member. No, not unless you find someone with Emirates miles and get them to redeem for footy tickets (you can put down any name for the tickets although the person named at time of booking must collect them, with ID). You then book them a flight with your miles in return. Thanks for the shout Rob. The Rotherham tickets are going to be 50 Nectar points each. This will be introduced due to the many East Coast customers complaining about the uselessness of Nectar points. I will be in for those! Haven’t made it to the New York Stadium yet …. Long drive, but would get rid of some Nectar points! 🙂 . I`m curious now. What was up for grabs? As I recall, they used to be for free Business Class tickets anywhere on their route network. I think it was 2,500 per ticket for the monthly draw. I don’t think they were doing the raffle tickets anymore? They weren’t doing them when I had points about to expire last year anyway. Soooo envious about anyone who gets to see the Chelsea-Arsenal game. My 2 favourite sides in UK. You can’t like both Chelsea and Arsenal!!! Tickets for the replay will be a tad more, I would think! Well done, Cambridge. The replay will help with their idea of turning the stadium into a “community asset”. I’m not sure how many tickets will be allocated, maybe 10k however many they get they will sell out anyway. I sold the tickets for £600 for the pair. Watched the game on mill road. Atmosphere was brilliant. Obviously Not as good as the stadium but for £600 I’m not complaining. Good news for the club anyway. Although they have no chance of getting a win at old Trafford. From my perspective the Easyjet credit has to be much better value, whatever the Arsenal ticket cash prices… And I haven’t flown Easyjet in 7.5 years! Haha ditto. Afraid I’d rather let them expire than go to a football match! The Easyjet deal, although not amazing, does at least allow some sort of useful redemption, especially given it can be for one way tickets. I’ve only just found this site. Can someone clarify for me what is meant in the article above, by “Emirates Skywards is a 1:1 transfer partner with American Express Membership Rewards.” ? I have a load of Emirates Skywards miles that are not that flexible. Does this mean that there is a way I could transfer them into Amex, then on to Avios…..by any chance??? Gerry – sadly it’s one way. You can transfer Amex Membership Rewards to Skywards, but not in the other direction.